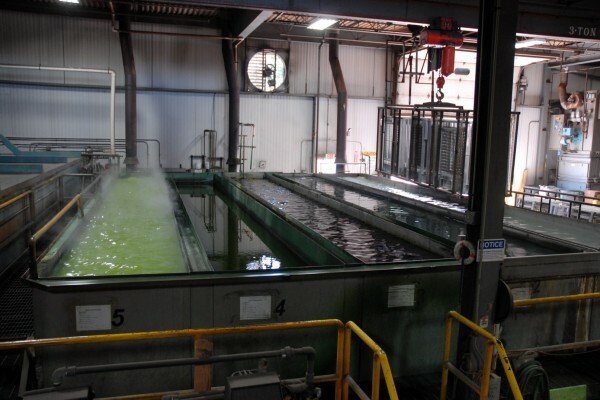 Material enters the coating process from our 5-Stage Dip Chrome Conversion Pretreatment process. 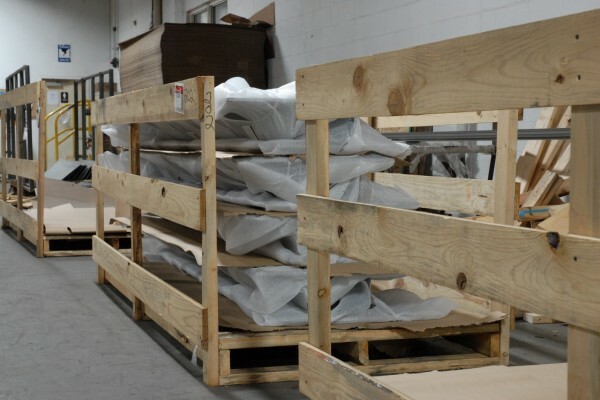 Spectrum Metal Finishing’s custom-designed racks minimize rack marks on the material’s exposed surface and allow for the greatest rack density in one pass. This ensures that the finish you are purchasing is both free of blemishes, and completed in the most efficient, cost-effective way possible. Spectrum Metal Finishing has two sets of primer guns (four total), which apply primer to each side of the material. Electrostatic application gives the best applied coverage at the lowest cost. Not all jobs require the use of primer; its use is dependent on the type of paint selected. However, Spectrum makes sure that if the material gets a coat of primer, it also goes through an ambient air process that allows the solvent in the primer to dry. This “flash primer” process guarantees good inner-coat adhesion of the primer to the topcoat. 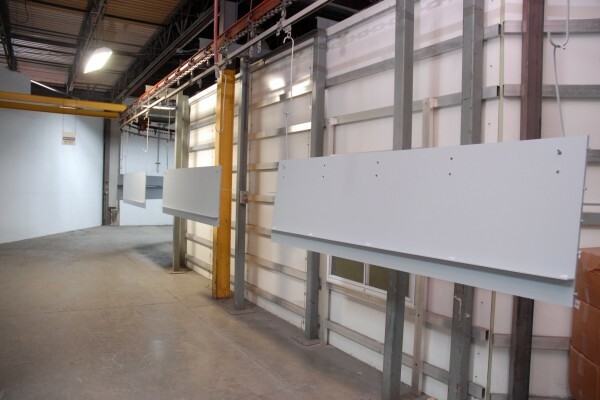 Unlike many other metal finishing operations, Spectrum manually applies paint in hard-to- reach, recessed areas prior to the topcoat being applied through the automatic spray booths. This ensures good color consistency over the entire part. Spectrum Metal Finishing’s turbo bell paint sprayers spin liquid paint to a mist-like cloud as it is sprayed onto the components. An electric eye precisely measures what is in front of the bells and automatically turns off and on the spray equipment, saving excess paint cost. Once the material passes through Spectrum’s automatic paint booths, it undergoes and eight-minute topcoat flash-off process. During this time, solvents in the paint are allowed to evaporate and dry, which provides excellent inner-coat adhesion prior to the clear-coat process going into the final bake. 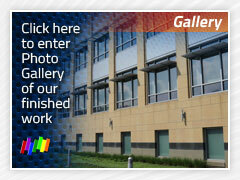 The paint specifications determine whether a particular finish should receive a clear protective coat or not. 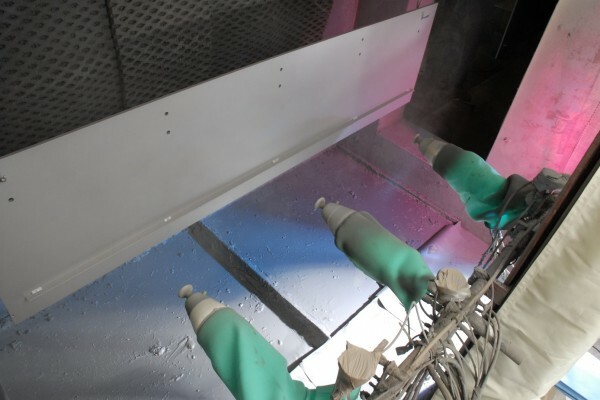 Two spray guns on each side of the line evenly distribute the clear coat in a single pass, if necessary. With a fresh clear coat, the material then moves toward Spectrum’s gas convection oven. 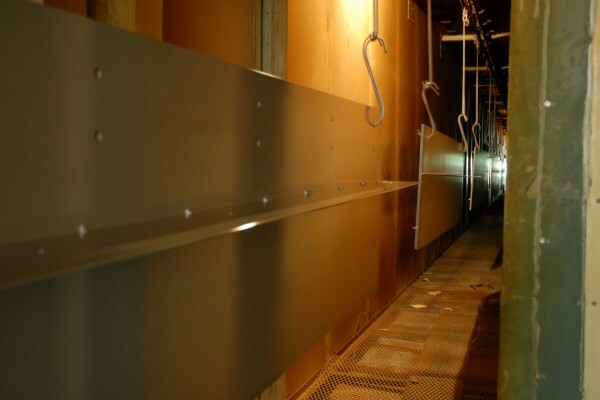 Spectrum Metal Finishing’s 250-foot-long gas convection oven cures the liquid paint and permanently fuses it to the aluminum. Our production line was designed specifically for wet-on-wet-on-wet application. This means that the primer, color coat and clear coat are fused together in a single layer. Many other finishing lines have to bake each individual coat, meaning their finishes are made up of multiple layers not fused together and are more prone to inter-coat adhesion problems. Every piece of material undergoes a strict on-line quality control inspection, meeting all AAMA specifications, which are logged and tracked. Then, workers carefully remove the components from the overhead conveyer and package per our customer specifications.